I never told you what I got for Mother's Day. 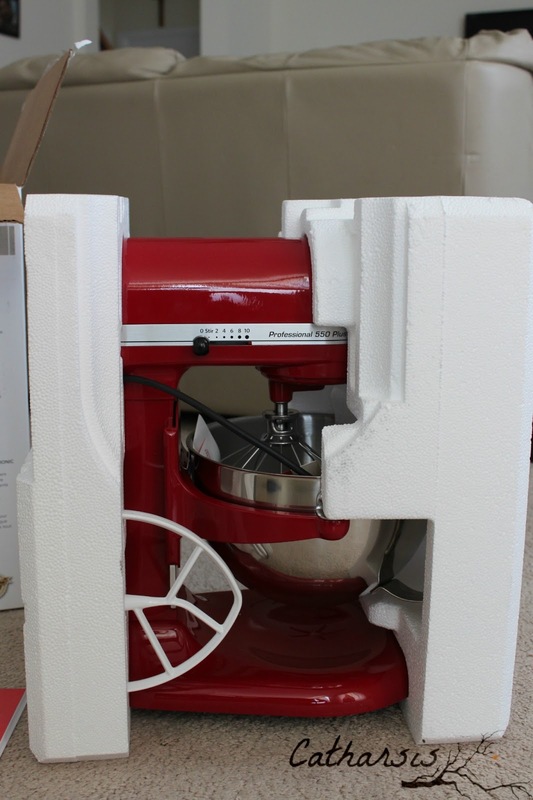 Well, my husband chose to give me a Kitchen Aid Stand Mixer and I was genuinely surprised...and perplexed. For the longest time, I was fine with not owning this kitchen appliance and actually used that as an excuse for skipping numerous recipes. Every time I would see a recipe online, in magazines or on television shows, and find that they require the use of this mixer, I'd say with such relief, "Oopps! Can't do that one! Moving on!" It was an easy and convenient excuse and I felt it saved me not only from complex recipes which I don't have much patience for, but also from unwanted calories. When I finally gave in to it and took it out of its box, I let it stay on the floor for a few minutes. I approached it as an intimidated puppy would an unfamiliar creature; circling it cautiously, as if sniffing away to gently familiarize myself to it. I was, undeniably, completely intimidated yet simultaneously mesmerized and awed, tempted by its grandiosity. Did I say that this sucker is heavy?? I was planning on storing it inside one of the lower kitchen cabinets but I realized that if I did that, I would never have the energy to take it out and use it...ever. 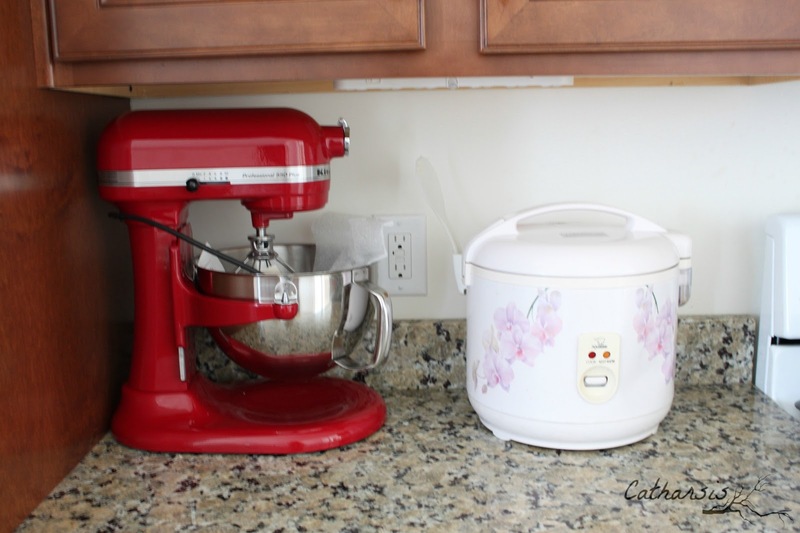 So I ended up reorganizing the kitchen until I was able to create a spot for it beside my trusty rice cooker. Now it just sits there in the corner, like a temptress in red. The next challenge is for me to actually read the manual and figure out how to operate this appliance. Hopefully, I'd get to it in the next five years. Wish me luck! Have you ever received a gift you were ambivalent about? Did you end up being friends with it? 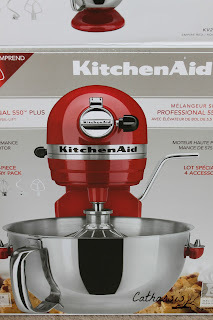 If you're a Kitchen Aid Mixer fan, do you have any good advice for me? Love mine, you can make meringue like there is no tomorrow. Hehehe, you're funny Kuya James. You need to give me pointers so I can finally use it! Oh I'm jealous and I already have one. I just wish I had bought the one you have with the floating bowl. I bought this for MYSELF for Mother's Day about five years ago. If you do any holiday baking it makes things so much easier - especially anything that calls for kneading dough. I absolutely love it. Mine is actually in a cabinet below the spot where I use it so all I have to do is lift it up, but yeah that sucker is heavy. The only gift I can think of right off is my mother in law giving me one of the snuggle things because I'm not a cover up kind of person. I'm always warm. But I'll be doggone if I don't use that thing for lounging on the sofa. My advice about the mixer is BEWARE - just having it is fattening. But seriously because it practically does the work for you I give baked goods as Christmas gifts. Haha that is so what I would do if I ever received one of them! Ok, Joy, I think that I need to tell you how I do it: you just leave it in your kitchen to impress everybody, but there is no need to use it. It is a lifestyle thing. And it must stay lean, right? My mom got this for her anniversary - it was a joke and she took it too well actually. She baked a lot of cakes after that. She said that this worked wonders for beating up mixtures! :) I have got gifts where I don't know whether it is good or I don't like it - I just go with the flow and see how it is useful; if I ain't using it much, I pass it to someone who does need it!